From AI to millennial, these topics should be on every leader’s radar. You would expect to see a feature article about trends in January. It’s a common practice among analysts and media to set your sights on what to expect in the upcoming year. We did that. But things shift quickly in this digital economy—and when it comes to customer expectations, the pace of change continues to accelerate and affect how businesses adapt and respond. We decided to take a mid-year look at five “hot” topics that have been generating a lot of buzz in the press and on social media in recent months. We reached out to industry thought leaders for their insights on why these issues are worth exploring now, how they will affect your operation, what actions you can take to prepare your center, staff and company, and what to expect in these areas over the next year or two. Employee engagement is getting a lot of attention right now. Making the workforce more productive and efficient is always a hot topic. However, now, there is an even greater focus on how to make the work more meaningful to employees. This is part of the evolution with an added twist on how to engage employees with unique perks and special ways to become invested in the organization. Expectations have changed a lot—on both company and employee perspectives. Customers expect a knowledgeable, productive person to interact with, which means the organization needs to better motivate and empower their people across the enterprise. This is where knowledge comes in. Getting the right info to the right employees so they can make smarter, faster decisions is key. Giving them information in real-time helps to create more personalized interactions with customers. Lots of employees want to self-manage these days. With this as a consideration, it’s important for contact centers to be transparent with staff about how they are performing. Allow them to compare scorecards, participate in self-training and learn how to work individually and also together as a group. I think a good starting point for contact centers is to look at their strategy. What are they doing to retract, retain and engage top talent? Are they looking at their metrics? Are they mapping it into an overall customer experience program? 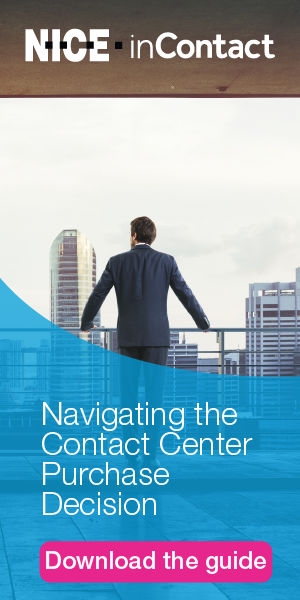 Contact centers need to create a holistic plan with these items as considerations. Most organizations want a more modern work environment—one that can adapt to personalized employees. Create opportunities for open shift bidding, mobile schedules and gamification, as well as an employee community so work becomes more meaningful and interactive. Modern work environment—companies will start to adapt work environments to personalize to and focus more on the employee. Automation—robotic process automation will help address speed and efficiency, and also free up employees for more complex work. Voice of the employee—collecting feedback from employees will be important, as they want their voice heard and their input can make an make a real impact on company success. By 2019, there will be an estimated 2.1 billion IoT-consumer devices on the market, according to research published by IDC (“Preparing your support team for the IoT-connected consumer”). Millions of customers around the world will be reaping the benefits of IoT-enabled products, but many will also come face-to-face with the problems associated with an environment of interconnected objects. Connected consumer applications means managing devices and services across multiple vendors, with customers uncertain where to turn when problems arise. In addition, a vast number of users don’t know how to operate their devices or aren’t aware of their full capabilities. This poses new customer service challenges in problem identification and resolution for vendors, but it also signifies huge opportunity for differentiation through proactive customer support. The contact center will play a critical role in delivering a great customer experience with the complexity of IoT-interactions requiring more support from customer service agents, not less. It’s no longer about understanding the technical requirements of one single device, but about how that device interacts within an entire ecosystem of products. IoT-related problems can quickly reach the limits of the decision tree, requiring skilled agents who can think creatively and cope with unusual contexts. As a result, agents will need to have the training and capabilities to provide consistent, cross-channel handling, and in many cases, be certified to address privacy and security issues related to IoT. Success metrics will also need to evolve beyond average handle time, to account for the additional resources and time needed to achieve a positive resolution. Given the evolving requirements and skillsets needed from a contact center agent supporting IoT products, leaders must start re-evaluating and recalibrating their hiring criteria. A pleasant demeanor and helpful attitude remain important, but tech-savvy, knowledgeable and problem-solving attributes become critical. This is all the more important in industries such as healthcare, where an agent’s actions can significantly impact the well-being of a patient. Further, leaders should prepare and account for the continual expansion of knowledge bases given the multiple variables in an IoT environment, and the constant innovation and deployment of new IoT products in the customer landscape. Investing in artificial intelligence and data analytics will also prove helpful in the agent’s support of the entire customer journey. Despite a popular belief to the contrary, a majority of IDC survey respondents anticipate a 10% to 50% increase in the contact center agent population to help meet the growing demands and opportunities related to IoT. Forward-thinking companies will use innovation, knowledge and service excellence as a way to differentiate themselves in this growing and competitive marketplace. And for many, finding a contact center partner with skilled agents that can deliver seamless support across a multitude of platforms may be the key to delivering successful end-to-end service in a mixed IoT environment. We have all used artificial intelligence (AI) available through Siri and Alexa to ask questions about where to eat dinner or to find the age of an entertainer in a movie we’re watching. Our daily use of AI sets the expectation for how it will change the landscape of knowledge in the contact center. For years we have attempted to stack-rank knowledge articles based on tags—hoping that the agent can locate the article, read it and find the answer. AI will change that paradigm by, not only reading the content of the article, but by consuming multiple articles, understanding the intent and pushing back the exact answer in natural language to the agent (and the customer via self-service). First, brand loyalty is not an absolute with millennials (ages 18-30 years). Different studies have mixed findings on brand loyalty with this group. However, consider that while Gen X was the last generation to grow up in an analog world and experience the leap to digital as adults, millennials are the first digital natives. Millennials’ perceptions of interacting with brands and customer service are shaped by this upbringing. These consumers have instant access to unlimited offers and endless choice through their phone, they are active on social media and they are highly influenced by customer reviews. In our recent “inContact Customer Experience Survey,” 8 out of 10 millennial respondents said they are likely or very likely to switch to another company after a bad customer service experience. The rapid evolution of Contact Center as a Service (CCaaS) in the cloud environment is creating an incredibly dynamic environment. Features that managers might have only dreamed of are available within the budgets of the small to medium-sized contact center thanks to CCaaS. Not only are these features available, they are also being rapidly deployed to solutions that can be updated and improved on the fly without causing major downtime or requiring manual software updates. In today’s competitive landscape of data-driven decision making, data accuracy and simplification is paramount. Managers are already taking steps to combine data from other solutions like CRMs in an effort to present an even more complete picture of the customer experience and contact center performance.